CHARLES COUNTY, Md. — If professional bass fishing fans didn’t know it before, they know it now. Justin Lucas is a force to be reckoned with — and it doesn’t matter which coast he’s fishing on. The California native, who now lives in Alabama, caught five bass Sunday that weighed 19-13 to win the Bassmaster Elite at Potomac River presented by Econo Lodge. His four-day total of 72-14 was more than 4 pounds better than second-place angler Jason Christie (68-7), who finished strong himself with 23-1 Sunday. 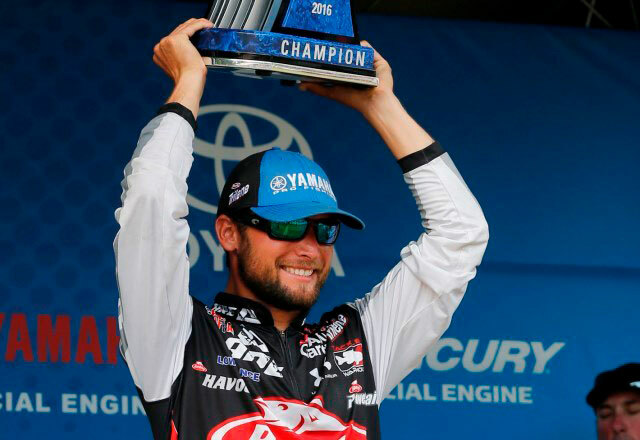 It was Lucas’s second career victory on the Bassmaster Elite Series and the first away from his native West Coast waters. The 30-year-old pro picked up his first win last season on the Sacramento River. Lucas won the event by finding and exploiting the kind of spot all tournament anglers dream of. It was a long parking dock adjacent to a water treatment plant on the upper end of the river. The water was 5 to 8 feet deep, and the dock had aquatic grass growing all around its edges. Instead of flipping a jig or skipping a soft-plastic bait under the dock like many anglers would in that situation, Lucas went with a drop shot rig — and he said that made all the difference. Lucas spent a little time fishing a stickbait and a swim jig. But his main technique was the drop shot rig with a 6-inch hand-poured worm in a purple and brown combo. He fished the rig on a 7-foot-6 medium-heavy Veracity Abu Garcia spinning rod and an Abu Garcia Revo MGX size 30 reel. There were times when he also used the Revo Premiere size 30 reel. His line choice was particularly important. He said the water was too deep under the dock for a standard baitcaster. Lucas insisted he found the spot by accident on the first day of competition after failing to get a bite there during practice. He knew there was a discharge at the water treatment plant, and he was hoping it would produce a few fish early. After catching a couple of smaller fish from that area, he decided to pitch the drop shot under the dock. Lucas said he was amazed the dock never received any pressure from anyone else, and he thanked the anglers from Maryland and Virginia for giving him plenty of space. “This is not like a secret spot,” he said. “It’s the community hole of all community holes. So it still just amazes me that no one else fished it. The biggest key to his week, Lucas said, might have been that he had nowhere else to go. The dock produced 20-4 on Day 1, 19-14 on Day 2, 12-15 on Day 3 and 19-13 on Day 4. Brent Ehrler (62-12), Bill Lowen (61-0) and Andy Montgomery (59-12) rounded out the Top 5. Alabama pro Gerald Swindle (53-6) finished 10th and maintained a 37-point lead over Keith Combs in the Toyota Bassmaster Angler of the Year race. Lowen earned the Power-Pole Captain’s Cash award of $1,000 for being the highest-placing angler who is registered and eligible and uses a client-approved product on his boat. Lucas earned the Livingston Lures Leader Award of $500 for leading on the second day. Lucas also won the Toyota Bonus Bucks Award of $3,000 for being the highest-placing eligible entrant in the program. The second-highest-placing eligible entrant, Jason Christie, received $2,000. The Phoenix Boats Big Bass Award of $1,500 was presented to Cliff Pirch for weighing in the overall biggest bass of the event — a 6-11 bass caught on Saturday. Lucas earned the A.R.E. Top Angler Award of $1,000 for being the highest placing angler using A.R.E. products.